‘The Sleeping Beauty’ of the Winelands. This is how those who roam the Lourensford wine farm in Somerset-West lovingly refers to the estate. It’s somewhat off the beaten path and not as easily spotted as as the wineries of Stellenbosch, Franschhoek or Paarl, which are often located alongside the main roads and highways in the area. Those who dare to take the wine route less travelled, will quickly find Lourensford wine estate. Somerset-West is only about a 45 minute drive from Cape Town. 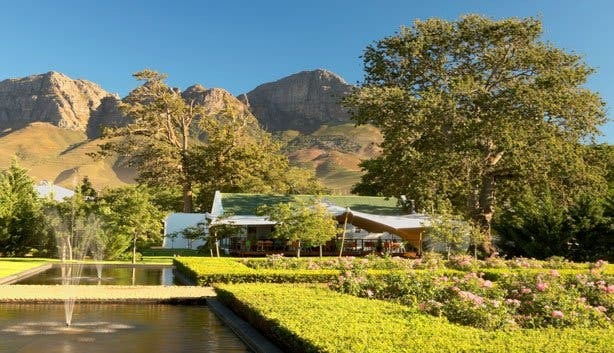 An easy recommendation for anyone looking for a leisurely lunch on a wine estate is the River Garden Deli at Lourensford. It is named after the Lourens River which runs along the farm and is one of the loveliest qualities of this Sleeping Beauty. Surrounded by the Hottentots Holland mountains and only 2km from the ocean The River Garden Deli is a great place to get some fresh air and locally produced food in the Winelands. If you like long, lazy lunches (or Sunday brunches) you will enjoy sitting on the terrace at the River Garden Deli - which has a lovely view of the surrounding rose and herb gardens as well as the gurgling fountains on the estate. Yet a quick and simple meal is also a speciality at the restaurant. A Pan-Bagnat (a type of Indian pastry) filled with nicoise-salad makes a lovely light lunch for those in a hurry, as does the Ceasar Salad with smoked chicken or goat’s cheese wontons. The fact is that ‘fresh’ always tastes better than ‘not fresh’. Much better. A wrap with Mediterranean vegetables, cream cheese and feta is one of the nicest vegetarian dishes on the menu at the River Garden – and all the ingredients are locally sourced and traceable. Not to mention the mezze platter with ham, salami, olives, cheese and freshly baked bread to dip in home made Lourensford olive oil. Actually the olive groves still need some time but the local olive oil will be coming soon. Marcel Broodryk, who works on the farm, says that “almost all the ingredients you could find on your plate at the River Garden are produced on the farm itself, or the immediate surrounds. The cheese is from a cheesery on the estate and the coffee is freshly roasted at the coffee roastery on the farm". The River Garden Deli caters well for meat lovers as well as vegetarians. Although the menu changes on a weekly, or even daily basis (depending on the fresh products available at the time), there is always enough to choose from for everyone. Main meals range from vegetarian risotto with spinach and goat’s cheese, grilled ham and asparagus, rib-eye steak with potato gratin and the trusted favourite: a lamb burger with rosemary. All priced at between R40 and R100 per person. You can also pair a suitable local Lourensford wine with every dish on the menu. Especially now that their 2009 Winemaker's Selection Chardonnay was rated amongst the top ten best in the world at the Chardonnaydu Monde® competition in France. 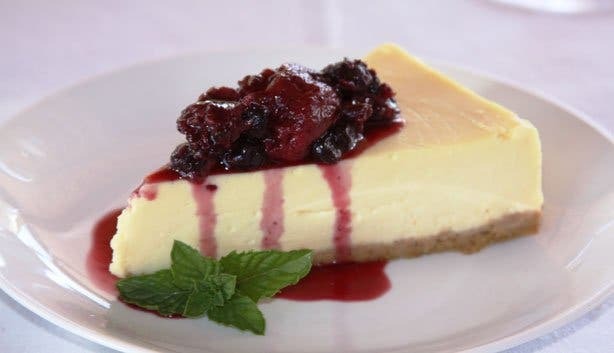 Dessert is of course something everyone can enjoy – from young to old, vegetarians and meat lovers. Our advice: the ginger crème brulee and the to-die-for chocolate brownie with caramel sauce. 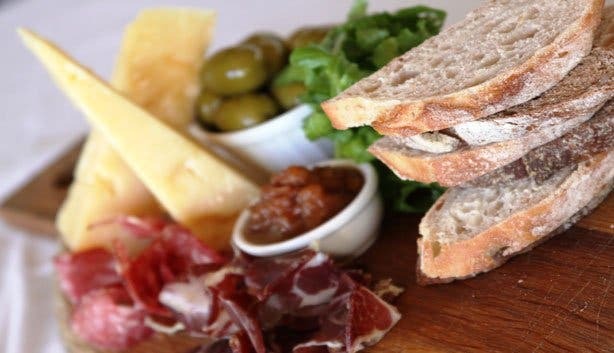 Yet you shouldn’t really leave Lourensford without trying their cheese, especially the gorgonzola – so make sure you save some space for the cheese platter. With a freshly roasted cup of coffee, of course. Parents are always looking for wine estates where they can take the kids and especially child friendly restaurants on wine estates. Indeed children are not overlooked with just a hamburger and chips. The child menu is about as varied as the adult menu. Although you do find the popular burger on the menu here too, the kiddies menu also includes pasta, chicken dishes, sausages and sandwiches. The terrace has lots of shade and it’s non-smoking. There’s also ample space for the kids to play on the grass while the rest of the family sits comfortably in the lime and orange plastic chairs on the terrace, or admire the light-hearted Frans Groenewald art displayed inside the deli. Which happens to be for sale too. Full tummy but still keen to try some of Lourensford’s other products? Many of the products served in the restaurant are also available at the River Garden restaurant and deli. Keep an eye out for locally produced olive oil, honey and preserves. The River Garden opens for breakfast (with warm bread just out of the oven) at 8:00am while lunch is served between 12:00pm and 15:30pm. As with the wine cellar, the River Garden Deli closes at 17:00pm, although wine tasting is still possible until 16:30. The restaurant is also available for weddings and other special events. To get an idea of everything that makes this winery so diverse, read our article ‘A day at Lourensford’.